Around the wider world of golf: Lydia Ko posted a 9-shot win at the Fubon LPGA Thailand Taiwan Championship, becoming the youngest player ever to win 10 LPGA events (and also regaining her #1 world ranking); Justin Rose won the UBS Hong Kong Open, giving him a win on both PGA and European Tours this year; Kristine Pedersen got her first professional win at the Hero Women’s Indian Open on the LET; and Matt Kuchar and Justin Hueber won the Bridgestone America’s Golf Cup (a team event) on the PGA TOUR Latinoamérica. Will McGirt drew first blood, posting a 62 very early in the final round to take the clubhouse lead at the Shriners Hospitals for Childrens Open. Unfortunately for Will, that lead didn't last very long and he ended up in a tie for 8th. While Will would have been a first-time winner, this week's event was slated for a different first-timer. Not long afterward, Smylie Kaufman posted a 10-under 61 that gave him a two-shot margin over McGirt and set the mark for the rest of the field at -16, about two-and-a-half hours before the leaders were expected to finish. With scores like McGirt's and Kaufman's -- and the reputation for low scoring that this event has built over the years -- you'd think that somebody near the fourth-round lead would make short work of Smylie's lead. But you'd be wrong. For some reason the rest of the field just couldn't seem to get it going Sunday. Big guns like Morgan Hoffman and Jimmy Walker stumbled right out of the gate, spraying the ball everywhere. First-timers like Brett Stegmaier and Patton Kizzire played nicely -- Kizzire even posted a 63 -- as did veterans like Alex Cjeka and Jason Bohn, but nobody could break the -15 barrier. Even Kevin Na, who once again put himself in contention, got fooled by a chip on the 17th and once again posted a runner-up finish. 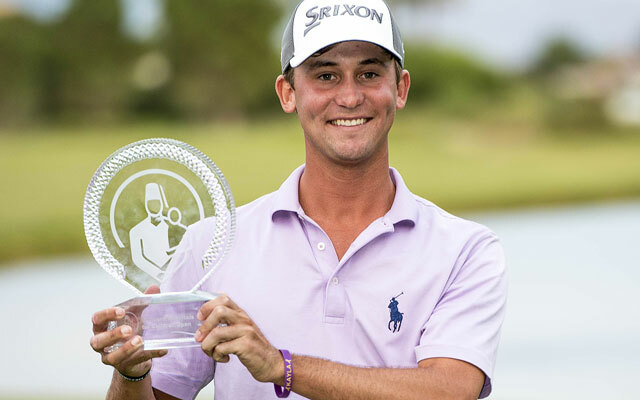 Instead, Smylie found himself in the unbelievable position of winning the tournament a couple of hours before it finished. According to GC, first-timers haven't won the first two events of the season since 1980. I don't know if this portends anything unusual over the next few months of the new season, but I'm certain Smylie isn't worried about it. After all, long odds are common in Las Vegas. In the meantime I'm sure he'll find a good way to celebrate his first PGA Tour win since he's right there in Vegas -- a celebration we'll probably never learn the details of, assuming the commercials are correct -- but at least we all know he'll be getting a nice new Limerick Summary. Why, look -- here it is now! But they couldn’t, so Smylie’s elated. The photo came from this page at cbssports.com. Umm, that would be the Fubon LPGA TAIWAN Championship, not Thailand (they play there in the spring).